Did you know that there's a Guinness World Record for most bridesmaids to bride in a wedding? And that they all have to be personally known to the bride? In 2010, Jill Stapleton, who owns Jill's Tumble World, a dance school, had every one of her students - all 110 of them - as her bridesmaids. Each girl chose her own dress (in either purple or teal, the school's colours), and carried a single rose. In 2013 a couple in Sri Lanka topped that with 126 bridesmaids (and 25 groomsmen, 20 page boys and and 23 flower girls). And it continued. Amy Ewing and Radio DJ Alex Simmons broke two records with 130 bridesmaids and 100 ushers when they married in Yorkshire in February 2015, a record they held for less for a month before Tina Ackles had 168 bridesmaids at her wedding in Florida on in April 2015. But seriously, there's a lot to think about when you come to decide how many bridesmaids/groomsmen/flower girls/page boys would be appropriate for your wedding. Ultimately, it is a personal decision that largely depends on your personal choice of who you want to stand up with you during the ceremony. That being said, here is some information that might help you develop a clearer idea of how many (if any) attendants (the usual word to describe the wedding party in gender-free terms) would be perfect for you and your wedding. The basic rule of thumb is scale the size of your wedding party to the number of guests. The commonly suggested ratio is 1 bridesmaid and 1 groomsman to every 35 -50 guests. The more formal the wedding, the bigger the wedding party. For a semi-formal wedding a smaller wedding party is usual. And for a very casual wedding, no wedding party is the norm. While most advice about wedding parties will suggest that they should be divided along gender lines - girls with the bride, guys with the groom - and that there should be even numbers, in the 21st century that advice can safely be ignored! Choose people who are important to you, regardless of their gender. Your brother is your best friend? Have him stand up with you rather than over with the groom. The reason often given for advising matching numbers etc, is that it looks better in the photos. Any good photographer will come up with ways of arranging the wedding party, regardless of mix, so the photos are great. In fact, when the wedding party isn't matched, you are more likely to end up with great photos because the photographer has to think beyond "girls to the left, guys to the right, couple in the middle". I've never seen explicit mention of age in any wedding etiquette book, or discussion of wedding parties, expect to define what a Junior Bridesmaid/Junior Groomsman is. But the unspoken, and generally accepted and unquestioned custom is that you choose your wedding party from your own age cohort. Doesn't have to be that way. I love it when couples include older family members or other significant people in their wedding party. Grandmothers love being a bridesmaid or a flower girl. It is also commonly advised (by the bridal press) that second marriages, and late-in-life weddings should skip the formal wedding, dispense with a wedding party, or have a very small one. Feel free to ignore that advice. I've had very memorable weddings where a dozen or so grandchildren have been involved in creative ways. Cultural considerations have a huge influence in how many bridesmaids/groomsmen would be regarded to be the norm. But oddly, enough, except for the traditions of various ethnic groups, culture is rarely mentioned in advice to the average Australian couple. Obviously, if your cultural background is one where large wedding parties are the norm, go for it. Your aunties will expect it. But if you're the average Australian couple, do not forget that the advice you'll be reading on the internet, in bridal magazines, etc, has a cultural bias that you might not even be aware of. For example, much of the Australian bridal press leans heavily on material from the US. And by far the lion's share of what we read on the internet is on websites based in the US, or, to a lesser extent, to the UK. It pays to be aware of where the advice is coming from, as well as what it is. 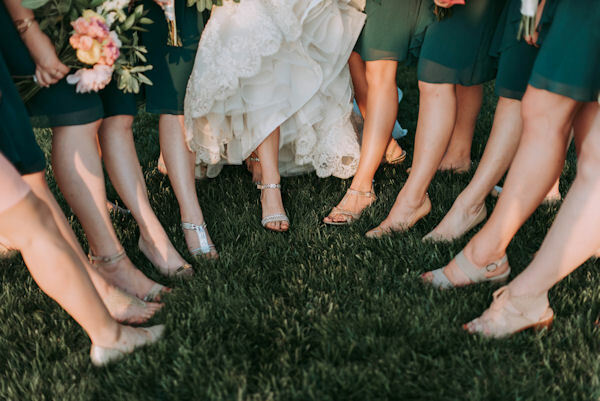 The overall US model of weddings sees more than three bridesmaids as the norm, but in many of the southern states a very large proportion of weddings will have double that number, or more. While in the UK, following the tradition of aristocratic weddings, uneven bridal parties where the majority of the bride's attendants are children, are very common. That's the trickiest question of all (apart from the obvious, going for the record!). There is a very fine line between an appropriate number and just too many. It comes down to judgement (in the overall context of your wedding, taking into account how many guests, the venue, the level of formality of the ceremony, and your personal style), and your personal choice.